The Global Volcanism Program has no activity reports for Washiba-Kumonotaira. The Global Volcanism Program has no Weekly Reports available for Washiba-Kumonotaira. The Global Volcanism Program has no Bulletin Reports available for Washiba-Kumonotaira. 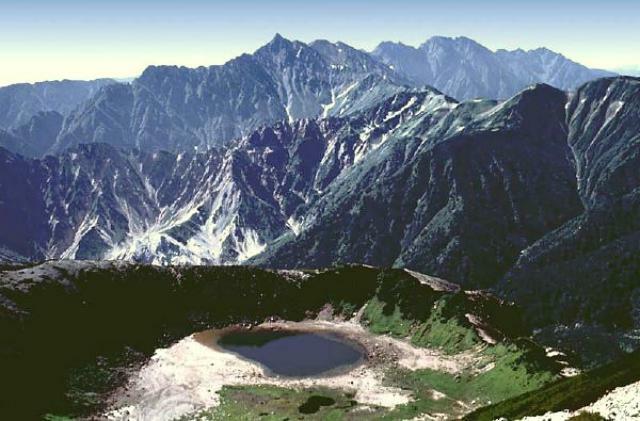 The Washiba-Kumonotaira volcano group consists of a cluster of small shield volcanoes with possible lava domes in a remote area in Chubu Sangaku National Park in the heart of the Northern Japan Alps. Iwagokekodani, an older Kumonotaira volcano was active from about 1-0.9 million years (Ma) . The younger Kumonotaira volcano was active about 0.3-0.1 Ma. Washiba-ike volcano is younger than 0.12 Ma (Nakano et al., 2001-). Hayakawa (2009 pers. comm.) indicated that the Washiba-ike explosion crater was formed in an area that post-dates the latest Pleistocene glaciation, and produced a tephra layer consisting of accretionary lapilli and fresh volcanic bombs. Hayakawa Y, 2009. (pers. comm.). Japan Association Quaternary Research, 1987. Quaternary Maps of Japan: Landforms, Geology, and Tectonics. Tokyo: Univ Tokyo Press. Ono K, Soya T, Mimura K, 1981. Volcanoes of Japan. Geol Surv Japan Map Ser, no 11, 2nd edition, 1:2,000,000. The Global Volcanism Program is not aware of any Holocene eruptions from Washiba-Kumonotaira. If this volcano has had large eruptions (VEI >= 4) prior to 10,000 years ago, information might be found on the Washiba-Kumonotaira page in the LaMEVE (Large Magnitude Explosive Volcanic Eruptions) database, a part of the Volcano Global Risk Identification and Analysis Project (VOGRIPA). There is no Deformation History data available for Washiba-Kumonotaira. There is no Emissions History data available for Washiba-Kumonotaira. Washiba-ike crater lies in the foreground with the dramatic granitic peaks of the Yari-Hodaka Range in the background to the south. The sharp-topped peak on the center horizon is Yariga-take (Spear Peak), a popular climbing destination in the Northern Japan Alps. The Washiba-Kumonotaira volcano group consists of a cluster of small shield volcanoes with possible lava domes in a remote area in the heart of the Northern Alps. A tephra layer from the Washiba-ike explosion crater overlies the 6300-year-old Akahoya Ash from Kikai volcano. Copyrighted photo by Shun Nakano (Japanese Quaternary Volcanoes database, RIODB, http://riodb02.ibase.aist.go.jp/strata/VOL_JP/EN/index.htm and Geol Surv Japan, AIST, http://www.gsj.jp/). There are no samples for Washiba-Kumonotaira in the Smithsonian's NMNH Department of Mineral Sciences Rock and Ore collection. Large Eruptions of Washiba-Kumonotaira Information about large Quaternary eruptions (VEI >= 4) is cataloged in the Large Magnitude Explosive Volcanic Eruptions (LaMEVE) database of the Volcano Global Risk Identification and Analysis Project (VOGRIPA).